At last! 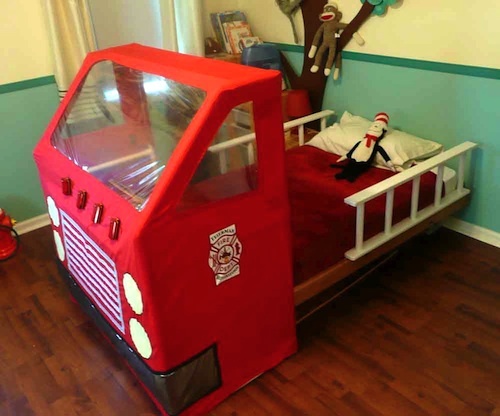 A photo of the finished fire engine bed, in place with ladders. This project is one I completed together with my daughter Amy and some support from our husbands. It is for my two year old grandson - and he loves it! The engine is a tent stretched over a PVC frame that slides over the end of a standard twin bed. It is complete with a steering wheel and flashing lights. Grampa truly wanted to add a siren but the mothers in this group nixed that idea. I have already completed a DIY blog post about this project located here. Check it out. Christmas Traditions - When Do You Change Them? My Stone Lamp was Featured on Completely Coastal!